Nazareth is the capital and largest city in the North District of Israel. In the New Testament, it is described as the childhood home of Jesus, and is a center of Christian pilgrimage, with many shrines commemorating its biblical associations. Archaeological excavations have revealed evidence from the Middle Roman, Crusader, Mamluk, and Ottoman periods. Modern-day Nazareth is nestled in a hollow plateau some 1,200 feet above sea level, located between 1,600-foot-high hills that form the most southerly points of the Lebanon mountain range. It is about 15.5 miles from the Sea of Galilee and about six miles west from Mount Tabor. The main road for traffic between Egypt and the interior of Asia passes by Nazareth near the foot of Mount Tabor, and then northward to Damascus. Nazareth is the largest Arab-Israeli city in Israel. A predominantly Arab-Christian town until the Arab-Israeli war that established Israel's independence, it became a predominantly Muslim city as a result of influx of Muslim Arab refugees during and after the war. Conflicts between Muslim and Christian residents have occasionally flared. Its most famous shrine is the Church of the Annunciation, which is the largest Christian church in the Middle East. The etymology of Nazareth, from as early as Eusebius (fourth century C.E.) up until the twentieth century, has been said to derive from the Hebrew netser, a "shoot" or "sprout," related to messianic prophecies concerning the Davidic Messiah as the "shoot of Jesse." The apocryphal Gospel of Phillip derives the name from Nazara meaning "truth." There is also speculation that "Nazarene," meaning "of the village of Nazareth," (Matthew 2:23) was confused with "Nazirite," meaning a "separated" Jew who had taken a vow of holiness. Archaeological research has revealed a funerary and cult center at Kfar HaHoresh, about two miles from Nazareth, dating roughly 9,000 years ago, in what is known as the Pre-Pottery Neolithic B era. The remains of some 65 individuals were found, buried under huge horizontal headstone structures, some of which consisted of up to three tons of locally produced white plaster. Decorated human skulls found there have led archaeologists to believe that Kfar HaHoresh was a major cult center in that remote era. St. Mary's Well—This shrine, commemorating the Virgin Mary, is located at an ancient spring possibly dating from New Testament times. Nazareth plays a major role in Christian writings dating back to the Gospels, written in the second half of the first century. Population estimates for it range from its being a small village of a few dozen persons to a town of up to 2,000. The Galilean city of Sepphoris, about five miles north of Nazareth, was undergoing major reconstruction in the early first century C.E. under Herod Antipas, and many scholars now think that Nazareth may have functioned as a kind of suburb, where the families of Sepphoris workmen would have lived. Some historians, however, argue that the absence of textual references to Nazareth in Jewish sources suggest that a town called "Nazareth" did not truly exist in Jesus' day. In ancient Jewish sources Nazareth is first mentioned in the third century C.E. A tablet currently at the Bibliotheque Nationale in Paris, dating to 50 C.E., was sent from Nazareth to Paris in 1878. It contains an inscription known as the "Ordinance of Caesar" that outlines the penalty of death for those who violate tombs or graves. However, it is suspected that this inscription came to Nazareth from somewhere else (possibly Sepphoris). In the mid-1990s, shopkeeper Elias Shama discovered tunnels under his shop near Mary’s Well in Nazareth. The tunnels were eventually recognized as a space below the floor into which warm air was pumped for a bathhouse. The site was excavated in 1997-1998 by Y. Alexandre, and the archaeological remains exposed were ascertained to date from the Middle Roman, Crusader, Mamluk, and Ottoman periods. In 1962, a Hebrew inscription found in Caesarea, dating to the late third or early fourth century, mentions Nazareth as one of the places in which the priestly family of Hapizzez was residing after the Bar Kokhba revolt (132-135 C.E.). According to the New Testament, Nazareth was the home of Joseph and Mary, the site of the Annunciation when Mary was told by the angel Gabriel that she would have Jesus as her son, and the location where Jesus grew up from his infancy to manhood. Saint Mary's Well, which housed a spring that for centuries was Nazareth's only water supply, may represent a contemporary historical connection to the New Testament story. In the apocryphal Protoevangelium of James, the Annunciation takes place not in Mary's home, but at a well: "And she took the pitcher and went forth to draw water, and behold, a voice said: 'Hail Mary, full of grace, you are blessed among women.'" The gospels of Matthew and Luke differ as the role of Nazareth in Jesus' infancy. Matthew describes the family as traveling from Bethlehem to Egypt, which a large population of Jews at Alexandria and its environs, returning only after the death of Herod the Great and deciding to settle in Nazareth (Matthew 2:13-23). The Gospel of Luke, however, describes Mary and Joseph as returning to Nazareth immediately after presenting Jesus at the Temple in Jerusalem as an infant (Luke 2:21-39). 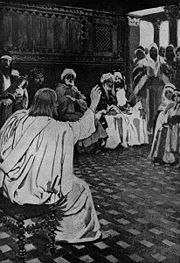 Jesus teaches in the synagogue at Nazareth. In John 1:46, Nathaniel asks, "Can anything good come out of Nazareth?" The meaning of this cryptic question is debated. Some commentators suggest that it means Nazareth was very small and unimportant. Others insist that the question does not speak of Nazareth’s size but of its goodness. Nazareth was viewed with some hostility by the evangelists because it rejected Jesus' ministry and “he could do no mighty work there” (Mk 6:5). In all four gospels we read the famous saying, “A prophet is not without honor except in his own country, and among his own kin, and in his own house” (Mt 13:57; Mk 6:4; Lk 4:24; Jn 4:44). In one passage the people of Nazareth even attempt to kill Jesus by throwing him off a cliff (Lk. 4:29). The first non-biblical references to Nazareth are relatively late. In 200 C.E., Julius Africanus, cited by Eusebius (Church History 1.7.14), speaks of “Nazara” as a village in "Judea" and locates it near an as-yet unidentified “Cochaba.” This curious description does not fit the traditional location of Nazareth in Lower Galilee and is likely due simply to the author's ignorance of Palestinian geography. However, several possible Cochabas have been identified: one 9.3 miles north of Nazareth (on the other side of Sepphoris); one in the region of Bashan (to the East of the Jordan River); and two near Damascus. Jerome, writing in the fifth century, says Nazareth was still a viculus, a mere village, in his day. In the sixth century, however, legends about Mary began to spark interest in the site among pilgrims, who founded the Church of the Annunciation at the site of a freshwater spring, today known as St. Mary's Well. Control over Galilee and Nazareth shifted frequently during Crusades, with corresponding impact on the religious makeup of the population. In 1099 C.E., the crusader Tancred captured Galilee and established his capital in Nazareth. The seat of the ancient diocese of Scythopolis was also relocated here under the Archbishop of Nazareth. The town returned to Muslim control in 1187 C.E. following the victory of Saladin in the Battle of Hattin. Christian control of the area resumed in 1229 C.E. as part of the events of the Sixth Crusade, but ended in 1263 C.E. with the destruction of all Christian buildings by the Sultan Baibars and the expulsion of the Christian population until Fakhr-al-Din II permitted their return in 1620 C.E. A town of primarily Christian Arabs, Nazareth was in the territory allotted to the Arab state under the 1947 UN Partition Plan, near the southern border within the state's northernmost part. The town was not a field of battle during 1948 Arab-Israeli War, although some of its nearby villagers joined the loosely organized peasant resistance forces, and troops from the Arab Liberation Army had entered the town. Nazareth capitulated to Israeli troops during Operation Dekel on July 16, 1948 after little more than token resistance. The surrender was formalized in a written agreement, where the town leaders agreed to cease hostilities in return for promises from Israeli officers that no harm would come to the civilians of the town. A few hours later, however, new orders were given to evacuate the civilian population of the town. Israeli commander Benjamin Dunkelman courageously refused to obey these orders. In sharp contrast to the surrounding towns, the Arab inhabitants in Nazareth were therefore never forced to leave their homes. The influx of Muslim Arab refugees from the surrounding villages and towns, however, changed the population of Nazareth from having a Christian majority to having a Muslim majority. 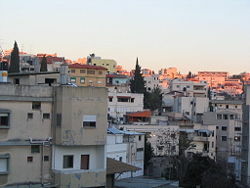 Nazareth today has a population of around 80,000. The majority of residents are Arab citizens of Israel, about 35 to 40 percent of whom are Christians and 55 to 60 percent are Muslims. The adjacent city of Nazareth Illit has a population of 44,000 Israeli Jews. Nazareth features many churches and other religious sites. Most notable of these is the Roman Catholic Church of the Annunciation, which was completed in 1966 on the site of a previous church. The largest Christian church in the Middle East, it contains a grotto in which can be seen a mosaic floor dating back to the sixth century or earlier. Several of Nazareth's churches include museums featuring sacred relics relating to Jesus and his family. 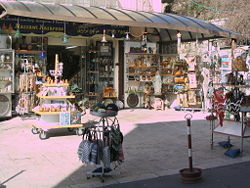 Nazareth is also a regional trade center. Tourism has become increasingly important to its economy, which also includes light manufacturing. Many Nazareth residents commute to industrial jobs in Haifa or to nearby jobs in Jewish settlements. The Jewish town of called Naẕerat ʿIllit was established on the hills overlooking the city in 1957. It includes an auto assembly plant, food-processing facilities, and textile factories and is the capital of Israel’s Northern District with a population of over 50,000. Nazareth's football (soccer) team, Maccabi Akhi Nazareth, plays in the Nationwide League. 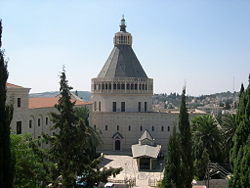 Nazareth is home to many churches, which are its chief tourist attractions. The most important commemorate biblical events. 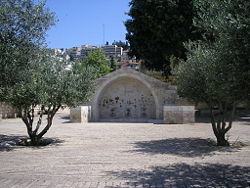 The Roman Catholic Church of the Annunciation marks the site where the Archangel Gabriel announced the future birth of Jesus to the Virgin Mary (Luke 1:26-31). ↑ Table 3 - Population of Localities Numbering Above 2,000 Residents and Other Rural Population. Israel Central Bureau of Statistics (2010-06-30). Retrieved May 21, 2012. Benedict XVI, Pope. Jesus of Nazareth: From the Baptism in the Jordan to the Transfiguration. New York: Doubleday, 2007. ISBN 9780385523417. Eisenman, R. James the Brother of Jesus: The Key to Unlocking Early Christianity and the Dead Sea Scrolls. New York: Penguin Books, 1998. ISBN 9780140257731. Emmett, Chad F. Beyond the Basilica: Christians and Muslims in Nazareth. Chicago: University of Chicago Press, 1995. ISBN 9780226207117. Israeli, Raphael. Green Crescent Over Nazareth: The Displacement of Christians by Muslims in the Holy Land. Portland, OR: F. Cass, 2002. ISBN 9780714652580. Shahin, Mariam and George Baramki Azar. Palestine: A Guide. Interlink Books, 2005. ISBN 9781566565578. This page was last modified on 14 November 2018, at 16:02.